We can't give you a quote from Robert's Removals , but we have hundreds of drivers waiting to offer you a great price. Have a question for Robert's Removals ? No problem, send them a message and they'll email you back as soon as possible. If you have a more general question you might find it answered in the FAQ, or you always contact one of our brilliant customer service team. * Robert's Removals won't be able to see your email address. Experienced man with an extra largeLutonn van with tail lift available to hire now. My van has a load space of 27 cubic metres, this is nearly 10 cu.m bigger than the standard luton’s most companies use. We are a small, family run business based in Nunhead SE4 with over 9 years experience in the removal industry. Business owner involved at all stages of job. Responsive to your needs and any unforeseen circumstance. We have a close knit team of well trained operatives who all speak perfect English. Vehicle is fully insured with policies for hire & reward, public liability and most importantly goods in transit to protect your items. The vehicle has Sat Nav, Front and Rear Cams, 500kg Tail Lift, Trolley, Skates, Straps, Webbing, Blankets and Assorted tools for dismantling and assembly. The vehicle is clean and tidy and is never used for waste or rubbish. Local, National and European Service. Single Items, Short Notice Jobs, Store Pick Ups. Really nice guy - helpful and efficient! Rob was on time, friendly and efficient. Job well done thank you! Rob was incredibly helpful and well prepared to safely transport all of my items across London. Rob is also very calm and really easy to chat to, which made what could have been a stressful day, a breeze. Would definitely book again. Rob and PJ were amazing! The move was over in 2 hours and couldn't have been any smoother. Lovely guys that I will recommend to friends and use again when needed in the future. So impressed with this service!! Rob was so helpful, I would recommend this company for any type of move, small sofa to a full house. Rob was on time, polite, calm and knowledgeable. 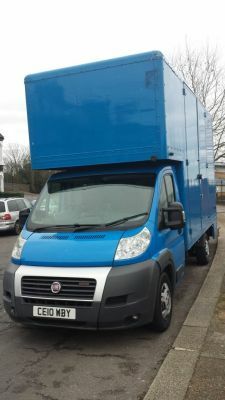 He had all of the equipment required for a cross- London 2 bed flat move with several pick ups on route. I will definitely be using this service again. Driver was polite, friendly and super-duper helpful. We managed to move all of our furniture and belongings from east to west London in a couple of hours, which would have taken a day or two if we'd rented our own van. Now we have the entire afternoon to unpack and build furniture!! Very friendly, helpful and toke good care of my things. The van was clean and equipped with all the necessities to transport my things safely. Definitely recommend Rob's services with confidence! !